pojaday and lot of foods | Felix Doll – Patenkinder Matara e.V. Sequentially. On Thursday was the all-month „Pojaday“, so free for me. Since on this day shopping malls and the like are closed, in principle as on Sundays with us, I couldn´t do much more then stay in at my place. In the afternoon I finally decided to go for a visit to my former place. Well, it just was thought as a small visit. Like all time, it was a nice welcome. Anyone who remembers this, I had already received an invitation from the family some time ago for dinner. Cause of the weather it was cancelled several times. So when I came to visit, they began preparing dinner for me. Remember, it was pojaday. Since this of course took place in Sinhala, and I could not intervene immediately, I just realised, when everything was already in progress. So I could not leave at this point unfortunately. It was a nice Evening; accordingly late I was taken back to my place. At Saturday we had an extraordinary teacher conference. It was now decided to buy food packages for all affected students as well as school materials for directly affected students. The directly affected students also would get a financial amount of emergency aid. At this point I have to explain something. One of the small instructions I got, was to pay the money directly to the affected families or students. It was simple thought because it´s much easier. Since it´s known, that the money be invested more often for other things than the corresponding sense, we´ve decided, that it´s more helpful for the students to buy materials, then to give the money to their parents. Sunday I had free again. So time for going to the supermarket for getting some things like hair shampoo and toothpaste. After I had dinner at my former place again. The Monday and Tuesday were usually again. Except of Monday evening. After visiting a house of an affected family again, we were on tour in the town to explore the prices of the necessary food and other materials we would like to give to the students. Then the day ended with an ice cream. It was interesting on Wednesday. 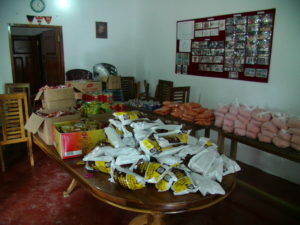 At last it was possible to buy the packages with food for the students. So I was picked up in the morning by Nadun, Kanthis and Tesheema with the TukTuk and went to the town. It started with a load of rice. Already this took up so much space and mass that Nadun and I had to go to the center alone to deliver the rice, which was only part of the whole quantity. 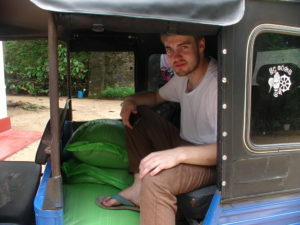 We already had lot of tours with the TukTuk but I never experienced that the Tuktuk went up at the front while starting. Despite extreme climbs and a considerable number of people. 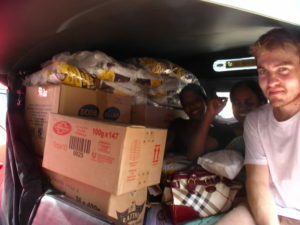 After the hard work, we went back to the city to pick up the second part of the food and our two secretaries, Kanthis and Tesheema. They had been waiting for us before. You can see from the pictures that this tour did not offer much space for passengers. 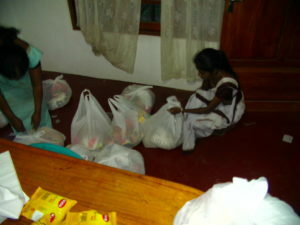 It was time again well cuddly back inside (Tesheema akka was more than once almost sickened by some large packs of noodles). Now it was necessary to sort the whole food. 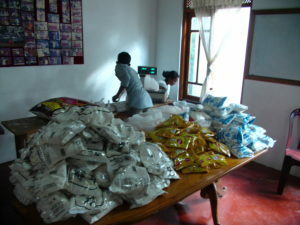 Partially, we had already packaged packets, such as. Noodles or tea. 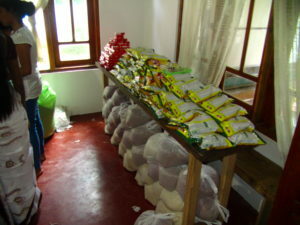 Things like rice or dahn were only available in large bags, so we had to pack them in small quantities. This lasted until the afternoon. 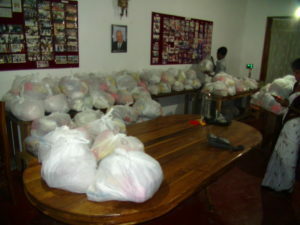 The packing of the individual food was however only half the work. Afterwards, it was about the actual packages for the students. 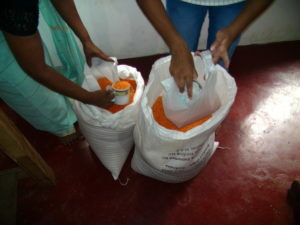 For this we had large plastic bags which were now filled with various things like rice, dahn, tea, sugar, flour or spices. A total of more than 80 packages. Tired, however, I went to the center the next morning by bus. There was a lot on the agenda. On the one hand, a visit of a germen family.. Accordingly, Reverent Vipassi had defined the transfer of the foodstuffs or the lack of financial emergency aid for that day. 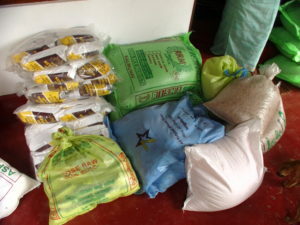 Part of the emergency aid had already been surrendered when visiting the houses. So we had to prepare the big hall and had to bring the food packages from the waiting room to the hall. With 84 packets, each with 10, … kilos and of the naturally prevailing warm temperature of course a quite effort. In addition, time was pressing. To facilitate each individual did not run everyone the entire distance, but always only one part to the next. My part was the start, so I had to pick up the packages on the ground. Afterwards a shower was necessary but of course the time was not there either. More and more affected people and scholarship participants with their parents came to the temple. Among them was the majority of my former German class of my first visit. On the other hand, I was glad to see the girls again. The circumstances, however, were somewhat depressing (for the first time for a while my weight / figure was again the theme L). Meanwhile, the Ruth family had arrived. This, however, had not yet communicated to me, so I was not with the tour of the temple (I have seen it already several times). At the foot of the great staircase, most of the flood-affected students, separated from each other directly and indirectly, had arranged themselves in two rows. After visiting the temple, Reverent Vipassi returned to the large hall with the family. There we could get acquainted with each other. After the first greeting, the ceremony began. As a guest, the family and I of course were placed on the stage next to Reverent Vipassi. Govindi Nangi, as before, was the speaker and led the event. In the meantime, the emergency aid was paid out and the food packages were handed over to the pupils or their parents by the family Ruth. Afterwards, there was a tea in the Waitingroom for the family. For this, pictures of the house visitings and the day before of the package preparation were shown. Afterwards the family, which returns Saturday night to Germany, left us again in the direction of Koggala. The next step is to organize the school materials for the directly affected students.